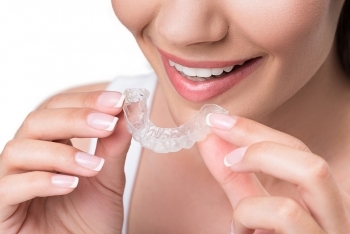 Invisalign aligners straighten your smile by applying the right amount of pressure to specific areas in order to gradually adjust the position of your teeth. Our dentists will create a unique treatment plan for you based on a digital scan of your bite. If you are interested in Invisalign, you can’t just go to anyone. Dentists and orthodontists must complete specialized training in order to offer Invisalign treatment. Dr. Scott Peppler is a Preferred Invisalign Provider, meaning that he meets additional requirements on top of the required training. It’s natural to wonder what Invisalign aligners are made of, considering they are going to be in your mouth for most of the day and night. Invisalign aligners are made of a flexible, patented thermoplastic called SmartTrack ®. The materials have FDA approval for long-term use in the human body and have been tested for biocompatibility. Am I a candidate for Invisalign treatment? Some severe cases may require other treatment methods that our dentists can discuss with you. Our dentists will help you schedule regular appointments. The frequency can depend on several factors, though most people need to come in every four to six weeks. You should wear your clear aligners for 20 to 22 hours a day, though you can take them out to eat, drink, brush, and floss. You can also remove them to play sports or attend important events, but make sure that you are still reaching the 20-hour mark for the best results. The duration of your treatment will depend on your dental concerns, though the average treatment time is 12 to 18 months. How often do I change to a new set of aligners? Most people receive new aligners every week or every two weeks. This will vary depending on your treatment plan and our dentists will tell you when you should change to new aligners. Our dentists may suggest that you use the Invisalign Cleaning System, or they could advise you to brush them with a toothbrush and toothpaste. You should only rinse your aligner in lukewarm water as hot water may permanently warp the material. Brush your teeth after every meal and avoid putting your aligners back in your mouth if you still have food residue on your teeth as this can cause staining. Smoking can also stain Invisalign aligners. The cost of Invisalign varies based on your treatment plan. At Meadows Dental Group, we believe that everyone deserves to have a beautiful smile. That is why we offer affordable financing options for our patients. Additionally, we offer a 5% discount if you pay in full upfront. Dr. O’Leary and Dr. Peppler are happy to discuss your orthodontic treatment options during a consultation. Call Meadows Dental Group today at 303-790-2323. We serve Lone Tree, Centennial, Highlands Ranch, and nearby areas of Colorado.